The entire class fee is due PRIOR to the day of the class. Class minimum is three (3). Supplies, kits and instructors have to be coordinated, so no exceptions. Sign up early! Class maximums are based on how much equipment and personnel can fit into the classroom, usually 10 to 12. If HHQ cancels a class, a full refund either to your card or via store credit will be given. If attendees cancel – we must get notification 72 hours prior to the class date to receive a store credit – no refunds. An exception to that would be if we have a waiting list or a replacement is found for the slot. Attendees are responsible for picking up supply lists and coming prepared to the class. Please procure fabric and supplies prior to the day of the class. Purchase supplies for the class on the day of registration or within 7 days of the class to receive a 10% discount. The discount cannot be combined with any other discount and is only applicable to class requirements – not on the kits designed for the class. It is your responsibility to engage the cashier for this discount as she may not know about your class schedule. Class fees cover instruction only unless otherwise stated. Kit & Design fees will be published separately if applicable. Some classes must adhere to Copyright laws that require each student to purchase the book or pattern required for the class. The exception for now is the OESD Embroidery Classes. The shop does not provide any supplies for classes or clubs. 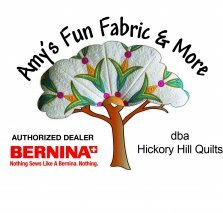 We are currently servicing only Bernina machines. We will sew in all machines to verify working condition – so bring the cord and foot control with the machine. We ask that all accessories are left at home. We will expect the owner to sign a sheet acknowledging what was told to intake personnel and verifying what parts & accessories were given to HHQ at the time of intake. A new needle will be put into the machine at the time of service and the old one will be kept should the owner want it back. We will make every effort during repair to keep the owner appraised of possible extenuating charges. Anything under $25 will be understood as part of repair costs. We reserve the right to dispose of any machines left at the shop for more than 30 days after repair/maintenance notification.